Pub Decision was purchased from Ron Montoya of Jefferson Yacht Sales in Michigan, November 2009. It is 18 ft long and 5 ft beam. 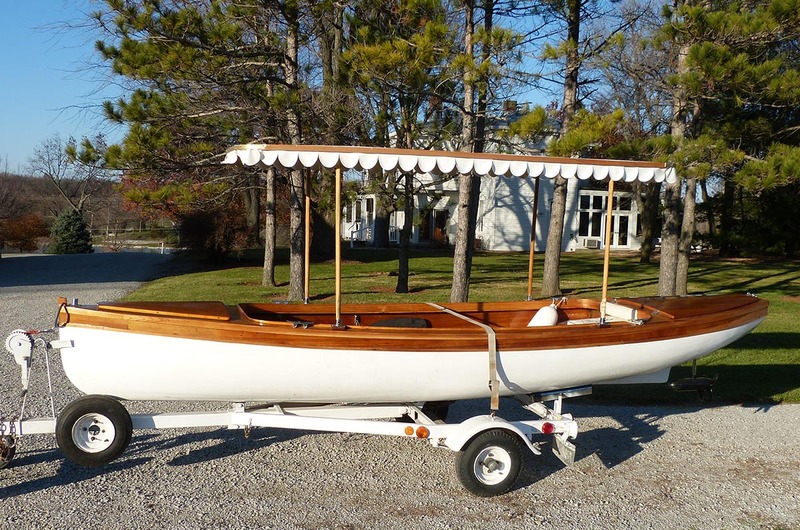 The seller had no idea who built the boat or much else about it for that matter. The hull #PCK1802A595 identifies that she came from Packard Classic Boats in Sarasota, Florida. The company was owned by Bud Finkl who apparently passed away in 2007. I wrote Vintage Race Shop during the summer to ask them if they had ever seen the boat. Bill Johns thought a guy named John Ford had built the boat, which turned out to be a fact. 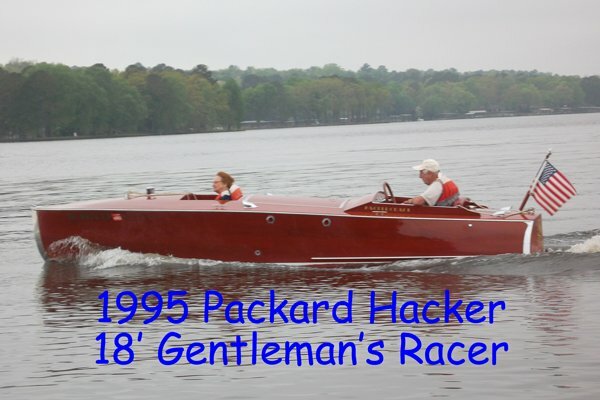 Bud Finkl built Packard boats but they were fiberglass reproductions of vintage runabouts, never a wood boat. A call to Gary Scherb in Florida verified that Bud had contracted John Ford to build four boats, three 18 ft and one 26 ft. Gary also told me his company did the finish work on the boat and installed the very hot (250 hp) V6 Chevy engine built by Flagship Marine Engine in Punta Gorda, Florida. It has hydraulic steering and transmission. My first outing in Pub Decision was on Lake Keystone, my home waters. I got fairly comfortable with it on flat water before I pushed it to its limit, a mere 50 mph on the GPS, but it would start to bounce. I later added some wedges under the transom which stopped the bouncing and slowed the boat a couple of miles per hour. We made all of the Heartland events in 2010 and thoroughly enjoyed them. Pub Decision is so much fun to drive in calm waters. I personally don’t mind a bit of chop but it gets quite wet! I’m not sure who named “Pub Decision” but it suits me as I grew up in English Pubs. Free Spirit was first delivered to Mr. and Mrs. Williams at Lake George, NY on 2/26/1997. Kally and I purchased the boat from Mrs. Williams (92 years old) on 8/10/2006. Free Spirit’s original name was “Gums” as Mr. Williams was a Periodontist. Her hull material is triple plank mahogany. In 2011 we discovered that Free Spirit was one of those Hackers built with ash frames, keels and chines. They were retaining moisture and there was some wood rot. A new bottom was built and installed by the Hacker Factory featuring a triple plank west system. She got new varnish inside and out, all chrome was polished and a new interior was installed. She also got a new mahogany banjo steering wheel and a second bilge pump was added. The restoration was completed in 2012. We also purchased a 2012 all aluminum Loadmaster tandem trailer. 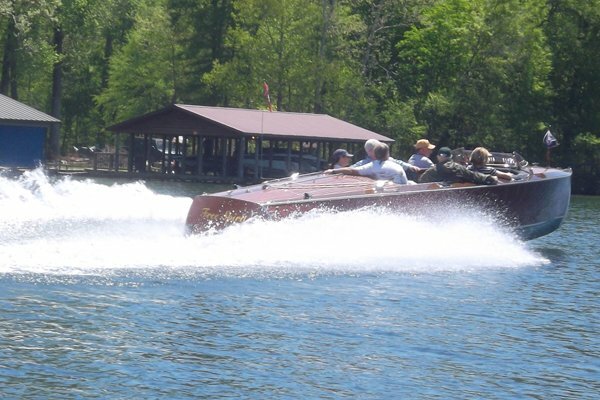 She is a great, smooth riding boat that has an excellent sound out the dual exhaust. She can easily carry eight passengers. We named her “Free Spirit” because that’s the feeling you get when you’re up to cruise speed with the wind in your face and hair blowing – you are a Free Spirit with no worries in the world. You’re as free as a bird. Just you, nature, and the cool blue waters of the lake with a white foamy wake spreading out in back of the transom. Last year (2014) I finished the wooden picnic launch that is a 50% version of a picnic launch operated by my Grandfather in the early 1900’s at New Boston, IL. The name of this boat is “VOLT” as it is electric powered.